[Bradley W. Lewis] continues to amaze us with this Return of the Jedi Lightsaber build. You’ll remember his fine work from his previous Episode IV replica. He’s taken the parts that turned out well for him and expanded upon them. In the demonstration after the break you’ll see the new version has a removable blade (which happens to house 90 LEDs). Just like the last time he’s got a Hasbro sound board and a speaker to add the Jedi-like sound effects. But there’s another trick up his sleeve. Two parts of the grip slide apart on a spring-loaded assembly to reveal the crystal that gives the weapon its sting. And as we found out the last time, [Bradley] really knows how to share his work in the build log. Oh, and the drawings above? Well, someone who plans this meticulously obviously knows what they’re doing. I could feel the joy welling up within me as I read this. My god. It’s perfect! Fantastic build pictures too. The light side is indeed powerful. I love his work! He inspired me to build replicas as well. I envy his skill and dedication. The end product is by far geek-worthy. I wish he would make a beam katana now. Now make one that can slice trough granite.. Thanks much! I am glad you guys like the project! Aside from the artistic value (which granted it is pretty cool), what’s the purpose of this ? It would make more sense for someone to be pursuing a true workable version of it. THEN, worry about modeling the housing. This is like building an X Wing fighter in your garage. Unless it can actually engage an F-22 Raptor in REAL combat, it’s nothing but “art”. @FredSanford – BECAUSE IT’S FUN DAMNIT! Not everything has to have a purpose… Sometimes its for childhood nostalgia! Oh no its another person spending their own time and money in ways you would not do so! How dare they! Seriously that’s one of the worst types of issues I see people respond to epic creations. How exactly would you start making a functional lightsaber like you think this guy should have? Just give me a basic overview of the technologies you’d need to make a handheld battery-powered device that can project a beam or energy only a yard long and cut through several feet of steel in seconds. It’s a harbor freight hobby lathe. They are cheap, go buy one. It’s fantastic! 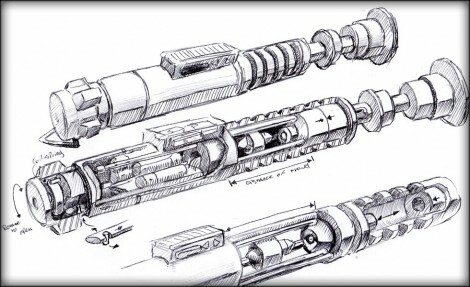 Outstanding lightsaber prototype, I wish next step will be a model of an X-Wing fighter. my solution for a real light saber was the plasma ball 3d system including a shiftable lense that changes the focus point from near the handle to about one meter away, i think when the lense movement is so fast one couldnd see the lens at all the plasma balls would be seen as a discreete line of light. Question is: how can any of us enthusiasts get our hands on one of your amazing creations?